This small stoneware pitcher with anti-slavery imagery was made in 1858 by E. Ridgway & Abington, a pottery firm in Staffordshire, England. The region had long been a center of ceramics manufacturing with numerous potteries churning out wares for consumers on both sides of the Atlantic. 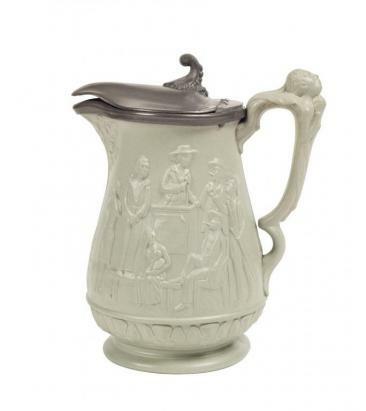 Renowned for its ceramics with highly detailed decorations in molded relief, Ridgway & Abington took Harriet Beecher Stowe’s best-selling novel Uncle Tom’s Cabin (1852) as inspiration for this pitcher. One side of the pitcher features one of the book’s famous scenes of the death-defying escape of the enslaved woman Eliza. Upon learning that her owner intends to sell her young son Harry to a slave trader, Eliza runs away with her boy, fleeing across treacherous ice on the Ohio River, the border between her home state of Kentucky and the free state of Ohio. The Ridgway designer captures the suspense of Eliza’s escape by showing her bonnet flying off her head as she leaps across broken ice floes with Harry clutched in her arms and the whip-cracking slave trader hot on her heels. Interestingly, Stowe’s account was based on an actual event from 1838 related to her by the abolitionist minister John Rankin, whose home in Ripley, Ohio, was an active “station” on the Underground Railroad. Rankin and his family helped the real Eliza on her flight to freedom in Canada. Although born in Tennessee, Rankin had Virginia connections: he attended Washington College (today Washington and Lee University) in Lexington and his brother Thomas was a merchant in Augusta County. Dismayed that his brother owned slaves, John Rankin wrote Letters on Slavery: Addressed to Mr. Thomas Rankin (published as a book in 1826), an early and highly influential abolitionist treatise. The Letters also convinced Thomas to free his slaves and join his brother’s anti-slavery crusade. Our Library has editions of both Stowe’s and Rankin’s publications, as well as materials related to slave escapes, the Underground Railroad, and abolitionism. The other side of the Ridgway & Abington pitcher depicts a slave auction, complete with a disconsolate group of enslaved people awaiting their fate, several eager buyers placing their bids, and the auctioneer standing at a podium with a poster advertising “By auction this day, a prime lot of healthy negroes.” Uncle Tom’s Cabin includes a heart-breaking account of a slave auction in which a mother is separated from her youngest son, “the only survivor of a large family, who had been successively sold away from her to a southern market.” In the pitcher’s version, the mother buries her face in her hand in a gesture of utter despair. Familial separation—or its threat in Eliza’s case—thematically unites the two sides of the pitcher. The breaking up of families was a regular and tragic feature of slavery: historians estimate that one in three enslaved children were separated from their parents through the slave trade. Furthermore, slave auctions were a common sight in antebellum Virginia. The slave markets in Alexandria and Richmond were among the largest in the United States, rivaled only by those in New Orleans and Charleston, and enslaved Virginians were frequently separated from loved ones and sold “down South.” Abolitionists used the auction motif to press people’s emotional buttons, to provoke horror at a system that reduced people to chattel and that ripped families apart. Images of slave sales appeared regularly in anti-slavery texts and objects, as in this pitcher. With a shrewd eye for popular taste, the Ridgway & Abington company capitalized on the blockbuster status of Uncle Tom’s Cabin and the growth of the abolitionist movement it sparked (In America, Stowe’s novel was the second best-selling book of the entire nineteenth century, only the Bible sold more copies! It was also a huge success in England and other countries.) Ridgway & Abigton knew that an item depicting Stowe’s story would appeal to customers on both sides of the Atlantic, and the company first started producing this pitcher in 1853—one year after Stowe’s book. You could order this design in different sizes and colors, and with the added feature of a metal lid. Displaying the pitcher as a decorative object in your home or using it to dispense water or another liquid at your table was equivalent to wearing a political T-shirt or liking a cause on your social media today—it signaled your stance on an issue to others, in this case, your opposition to slavery. The narrative pictures of Eliza’s escape and a slave auction were also intended to spark conversation. And, in the 1850s, there was no topic that was more hotly debated in the halls of U.S. Congress, across the pages of the nation’s newspapers, and around the tables and parlors of American homes than the issue of slavery. This small pitcher links to a much larger historical context including the domestic slave trade, the influence of art and literature on public opinion, the debate over fugitive slaves, and the international networks of the abolitionist movement. Abolitionist Pitcher, 1858, by E.